Have you ever wondered what your mouse is doing when it’s moving around all day as you work? Well with a cool app called IOGraphica, you can do exactly that on a Mac or Windows PC. The end result is quite interesting as you can see from the pictures. 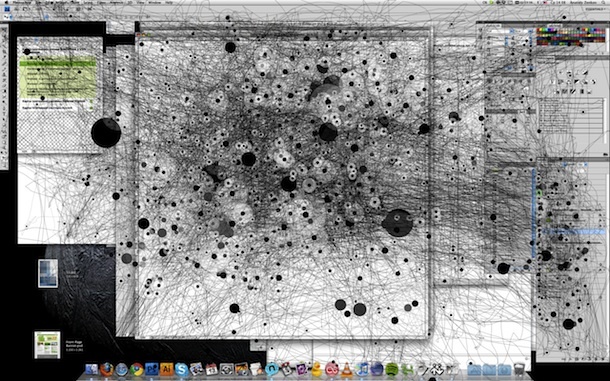 IOGraph is a really cool program that runs in the background and tracks all of the movements and pauses of your mouse (or trackpad) as you use your Mac. You can then export the mouse tracks into an image file with either the movements overlayed on your desktop workspace or just as an individual tracking graph. It’s most interesting when you launch the app and let it run for hours while you go about your day, coming back to it later to see where your mouse has been most active. The black dots are mouse pauses and grow based on the length of the pause, but you can configure IOGraph’s tracking to not include this in the images it produces if you’d rather not see them. So other than being cool and producing interesting images, is there a use for IOGraph? I would say yes, particularly for application, web, and GUI developers. Imagine having beta testers run IOGraph over your designs so that you can see how people interact with your app, and what works and what doesn’t? This is made possible across all platforms too, since IOGraph is available not just for Mac OS X, but also for Linux and Windows. 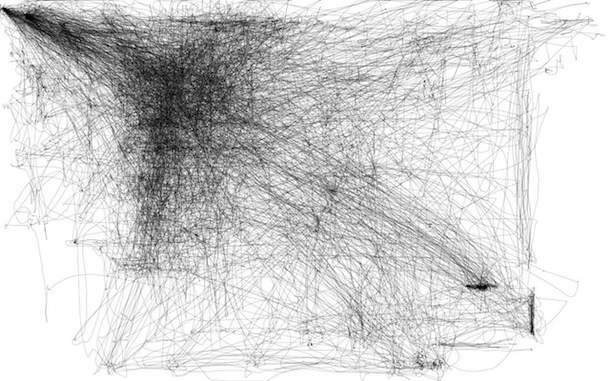 Even if you don’t use IOGraph for anything productive, it’s still fun to play around with, and it’s definitely fun to see what your mouses tracking behavior and movements are in relation to what you do on your Mac throughout the day.